If you ever find yourself staring down a saber-toothed tiger due to some time travel mishap, a word of warning: Those massive teeth aren't your biggest problem. Its phenomenally strong arms will have you pinned in seconds. Although those gigantic canine teeth are undoubtedly some of the most fearsome pieces of natural weaponry evolution has ever devised, they did have their drawbacks. Because they were so huge, they were much more vulnerable to fracture than the teeth of modern felines. Whereas the more circular teeth of today's cats can withstand forces in any direction, those saber teeth could be broken relatively easily if hit hard from the side. That would have theoretically given cornered prey a pretty good chance of escaping, provided they could get off a couple good, hard blows to the tiger's teeth. To better understand this apparent weakness, paleontologists Julie Meachen-Samuels and Blaire Van Valkenburgh looked elsewhere on the saber-toothed tiger's frame, and they quickly discovered how the beast compensated for this weakness in its teeth. Studies of saber-toothed tiger limb bones reveal unusually big scars left behind by muscle attachments, suggesting the arm muscles themselves were unusually big and strong. They followed up on this notion by comparing the bones of the saber-toothed tiger with those of 29 other cats, 28 of which still walk the Earth. The results were striking. 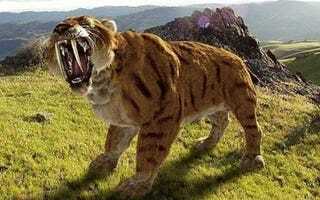 While the saber-toothed tiger's legs scaled to the same size as the other cats, its arms were way off the charts. The arm bones were much, much bigger and had a dense outer layer of cortical bone, providing the arms even more protection from stress and damage. Those arms were almost certainly used to pin prey down on the ground, placing the prey out of reach of those teeth and providing the tiger ample opportunity to administer the fatal bite. "When I looked at the arm bones, Smilodon fatalis [the saber-toothed tiger] was way out in left field. As muscles pull on bones, bones respond by getting stronger. Because saber-toothed cats had thicker arm bones we think they must have used their forelimbs more than other cats did. The findings give us new information about how strong their forelimbs were and how they were built. This is the first study to look inside sabertooth arm bones to see exactly how much stress and strain they could handle." This finding has other applications, as well. As one actual headline announcing the news puts it, this study shows "Why you should never arm wrestle a saber-toothed tiger." I can honestly say this was not an idea that had ever crossed my mind as a thing I should do, but it's good to know the headline writers of the world are looking out for me. I guess I'll just stick to arm wrestling regular tigers instead.